How amazing that this month, my Secret Recipe Club assignment was the same blog that had me last month. I am very familiar with Cairns Manor and I was so excited to look around the blog for something to make. Jo is a domestic goddess and has some very delectable recipes on her site. As an animal lover Jo and I are on the same wavelength and I had a great time browsing her blog. It did not take me long to settle on my choice! I am so intrigued by using beer in baking and as this recipe has chocolate in it (my second love) I could not resist. We are very fortunate to have some great local breweries near to us, and my favourite is Triggerfish. They are situated in Paardevlei, and the Friday before I decided to bake this cake, I drove into the complex to purchase one bottle of stout. I got a bottle of Empowered Stout which has an aroma of coffee, dark chocolate, dried fruit, raisins and licorice and pairs well with meat dishes or dark chocolate. Not wanting to let a good opportunity go to waste, I bought a selection of their beers so that Dave and Alex could enjoy them over the weekend. I baked the cake exactly as per the recipe, but after an hour it had not cooked through. The top was burnt and I sliced that off and left it in the oven for longer, but eventually decided to just leave it as is. There was nothing wrong with the cake per se (we ate every last slice) but I could not blog a recipe that was not right, and I could not take a photograph of the cake. On the Monday I went back to Triggerfish and when I told Eric (the owner) what I was baking, he gave me the stout I needed to bake the cake. I am so glad I keep a water bottle in my car, as this was used for some black marlin which is only available on tap. This Russian Imperial variety has a lovely coffee, dark chocolate, aniseed, dark fruit and caramel aroma and pairs well with rich warm deserts and dark chocolate. Needless to say, I left with a few more bottles again to ensure the boys would not go thirsty during the week. I baked the cake again, but halved the batter into smaller tins, and it worked a treat. 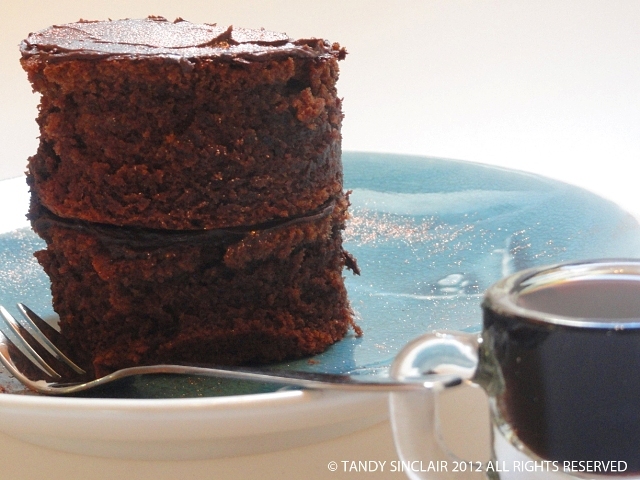 I would definitely bake this again as you get a really malty, chocolate flavour in this delicious cake. have you used stout in baking? You keep luring me into wanting to try stuff, but I just don’t have the eating audience to do them. you could be like me and have a fridge full of goodies! I never used stout in my baking before because you rarely can find it here. Your chocolate stout cake looks very mouthwatering, Tandy 🙂 MMMMMM! A lovely presentation too! Thank you Sophie! I wonder if any other unusual beer would work? I think Guiness would work too! Or a dark Brown leffe or a trappist? do give it a try and let me know! Love the Pinit button on the photo. I’ve heard of this stout cake but never actually tried it. Looks delicious! I don´t enjoy dakr beers to drink and have only ever used them in casseroles, but am sure this must have been so moist and tasty – it looks great! Hi Tandy, now this recie sounds right up my street! I’m not a greta fan of the heavy stouts to drink, occiasionally they are perfect bu I love to cook with them ! The combination of chocolate and stout just can’t be beat! Great cake! This cake looks and sound amazing! Great SRC pick! Looks like second time was the charm with this recipe. I’ve been wanting to try a chocolate/guinness or stout recipe for a while now and this looks like a good recipe to try! if you do give it a go, please let me know what you think! Interesting. I have made some Guinness gingerbread that I love! Oh wow, I have to try that! I have never used stout in cooking, but you are certainly tempting me! This looks fantastic! I’ve never tried this, Tandy, but I will now! It looks delicious! Oh yes, one of my favourite cakes uses Guinness and dark chocolate! Yours sounds delicious, Tandy! I shall wish one your way! I’ve always wanted to bake with stout given the tons of recipes including it. But it’s difficult to find here in India. The cake looks delicious though, I’m sure I’ll be able to find it soon enough, bookmarked for that time! What type of beers can you find there? What a great recipe. Once I used guiness and made brownies. Your cake looks much better. This looks delicious! Great dessert! I’ve never used stout in cakes…but now I’m tempted. This cake looks soft and delicious. We are chocolate lovers in my family!! I’ve heard of these cakes made with stout, but I’ve never tried one myself. It looks so incredibly tempting! I am impressed with your diligence in getting the recipe correctly made! We have a Guinness in our pantry that is waiting to be baked into a chocolate cake. Possibly for an upcoming birthday. I can’t wait to try it!